In 2016, four-time CrossFit Games veteran Katrin Tanja Davidsdottir did what only two other athletes have done in the history of the CrossFit Games: win the CrossFit Games twice (Annie Thorisdottir won the Games in 2011 and 2012, and Rich Froning held the men’s title from 2011-2014). 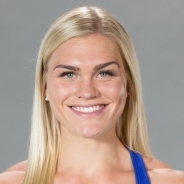 A native of Reykjavik, Iceland, the former gymnast and track athlete took 30th in her first Games appearance in 2012 after less than a year of CrossFit, improving to 24th in 2013. Famous for recouping her mental strength after a devastating event at the 2014 Europe Regional sidelined her from the Games that year, she returned in 2015 with an improved focus and took the title of Fittest Woman on Earth. Now living in Natick, Massachusetts, she proved it was no fluke with a repeat victory in 2016. 2016 6th Rogue Fitness Team Black Josh Bridges, Annie Thorisdottir, Richard Froning Jr.